(CNN) -- World number one Rafael Nadal and third seed Novak Djokovic are both through to the last 16 of the Madrid Open after comfortable straight sets victories on Wednesday. 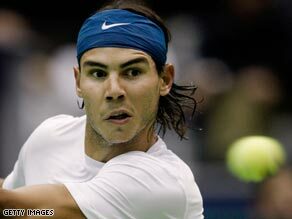 Nadal made just three unforced errors in the whole match on his way to victory over Jurgen Melzer in Madrid. Top seed Nadal, who has voiced criticism of the combined ATP and WTA tournament this week, remarkably made just three unforced errors to defeat Austrian Jurgen Melzer 6-3 6-1, his 32nd successive clay-court win. The Spaniard will now face Germany's Philip Kohlschreiber, who knocked out Croatian 13th seed Marin Cilic in a marathon three-setter, for a place in the quarterfinals. Meanwhile, Serb Djokovic, who has slipped to fourth in the world rankings, continued his progress wirh a routine 6-3 6-3 victory over Spain's Oscar Hernandez and will next play Italian Andreas Seppi, a 6-3 4-6 6-4 winner over American Sam Querrey. Fifth seed Juan Martin Del Potro advanced after Czech Tomas Berdych quit while trailing 6-2 4-1, with the South American set for a repeat of his Rome showdown against Swiss Stanislas Wawrinka. There was a surprise in the women's event where sixth seed Svetlana Kuznetsova, who has reached the last two WTA Tour finals, was crushed 6-3 6-2 by Alona Bondarenko of the Ukraine. However, seventh seed Victoria Azarenka of Belarus comfortably continued her progress with a 6-4 6-1 win over China's Peng Shuai.